I had another opportunity recently to take another assessment test. 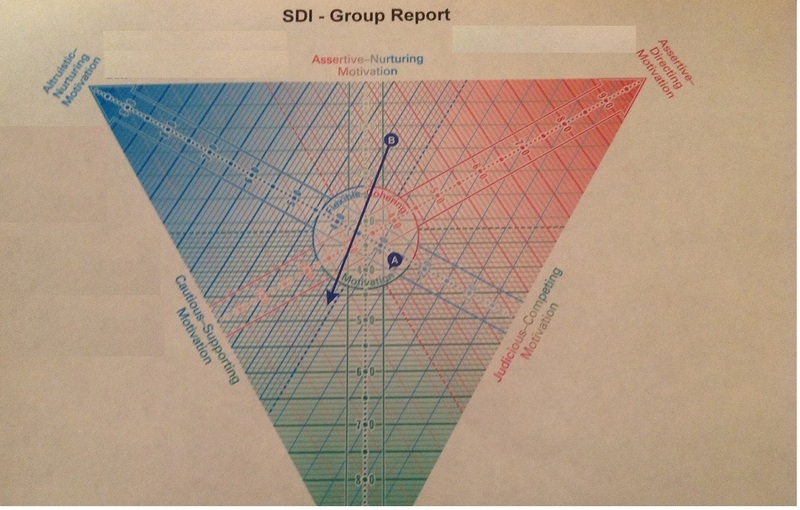 This one was the SDI (strength deployment inventory), which (according to the official materials) “helps people identify their personal strengths in relating to others under two conditions: 1) when everything is going well, and 2) when they are faced with conflict. It is an inventory for taking stock of motivational values.” In this one you answer a series of complex questions about how you act/react in specific scenarios. For me, there were no clear cut answers. The premise is that there are 3 primary motivations: altruistic nurturing; assertive-directing and analytic-autonomizing. As you would assume, the altruistic nurturing motivation relates to the needs of others, always wanting to help, being open, supportive and compassionate. The assertive-directing ones relates to leadership, opportunity, immediate action, innovation, accepting challenges and risk-taking. Lastly, analytic-autonomizing relates to objectivity, practicality, controlling ones emotions, logic, reliability, and thinking things through before acting. There is also a notion of a hub which equates to flexible-cohering, where one is open minded and willing to adapt, likes to be known as flexibly and can foster consensus-building. 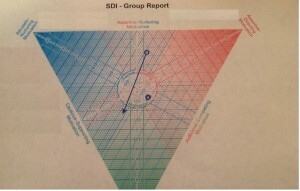 The SDI is modeled in a way that there are also blended areas with unique attributes including assertive-nurturing, judicious-competing and cautious-supporting. The second part of the SDI focuses on how you act in conflict. Interestingly for me, I do not act that much differently in conflict than I do regularly. My conflict sequence is described as “a person who first tries the analytic, logical and reserved response to conflict followed by an assertive, forceful attack based on logic and strategies.” The last resort of this would be to surrender. I blame it on the stubbornness I inherited from my dad. I’m “A”, the little dot in the bottom right of the center circle. B was the assessor and is included as a comparison to yourself. While I wasn’t surprised by the results, I did learn a lot through the experience. I could associate with the assessment and quickly retrieve examples that fit the different scenarios. It reinforced the environment that I thought best suited me, and highlighted some insights into how those motivations and reactions are viewed by others. There is a fine line for all of these motivations and you can quickly be misinterpreted: from confident to arrogant; persuasive to abrasive; competitive to combative; persevering to stubborn; reserved to cold; flexible to wishy-washy; open to change to inconsistent.